From the first-person perspective, CAFA ART INFO has promoted a micro video program, entitled “ART WALK: Behind the Scenes” since September in 2018. With a focus on independent artists’ working environments, life stories and artistic creations, we introduce a tour for spectators to explore how an artist actually survives and develops in the macro environment of the current art world. As a practical presentation of the program, CAFA ART INFO and Hui Art Space will jointly organize a series of academic micro-solo exhibitions for all the artists involved in “ART WALK: Behind the Scenes”. The first season of “ART WALK: Behind the Scenes”is composed of 12 episodes, and each micro-solo exhibition will combine each video record with a representative work of each artist. Starting from the case study of each artist, the exhibition intends to demonstrate the multiple authentic expressions from independent artists in the environment of contemporary art. The project will start with the solo exhibition of Wang Qingsong opening on April 13. Wherever there is a mainstream group, there are also non-mainstream groups, they might be treated as heterogeneous or heretical thus the phenomenon of their marginalization has always existed. “ART WALK: Behind the Scenes” focuses on the lives and creations of non-mainstream artists, while realistically recording their real working environment and living conditions. Here, we record and present their alternative artistic experiences, individualistic experiences of life and showcase the other world they inhabit. The idea of “ONE EXHIBITION” occurred to me in an instant. “ONE EXHIBITION” is a brand new experiment for an exhibition, which intends to present the profound aspects of the field of art with one piece of artwork within the mediums of video, photography, painting, sculpture, design, while it also ushers in more thought provoking maps. 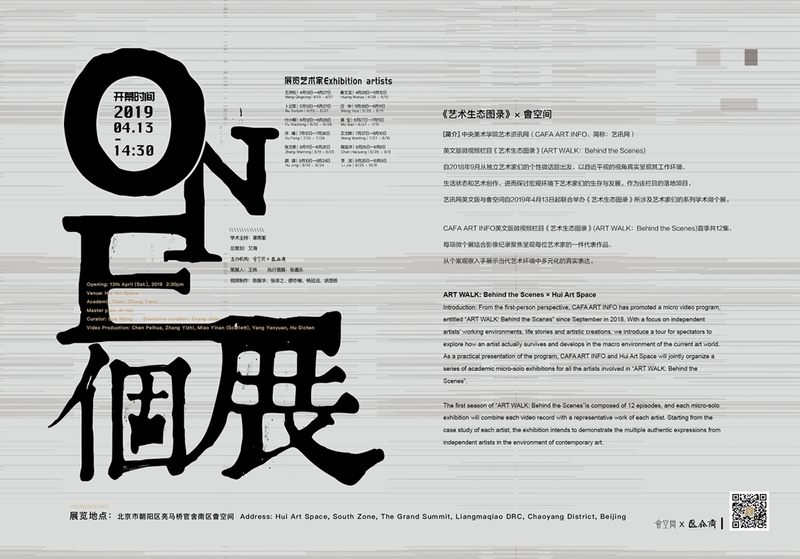 This time, Hui Art Space will cooperate with the CAFA ART INFO (CN & EN) to present the exhibition in the Grand Summit, Club Building which will contribute to the interactions and exchanges of contemporary art between China and other countries. Currently, the advent of “ART WALK: Behind the Scenes” has promoted the formation of “ONE EXHIBITION”, as the short videos of artists in various stages interpret artists’ creative state while combining videos with artworks, which enables viewers to watch and think while immerging themselves in an independent space to perceive the works and stories behind the artists. One of the most difficult things to do is to realize that they are not the center of life, but only on the edge. Artists reflect the complexity of the world through doubt while paving the way for thoughts through inquiries. How does an artist maintain his or her independence and reflection on a society that is increasingly full of materialistic “carnivals”? “ART WALK: Behind the Scenes”focuses on the non-mainstream independent artists and reflects on their respective journeys full of joy and pain using plain and authentic narratives. By using a minimalist way of juxtaposing moving images with a piece of artwork, every micro-solo exhibition of the artist is the key to his or her artistic realm, which consequently invites you to embark on his or her unusual pursuit in art.